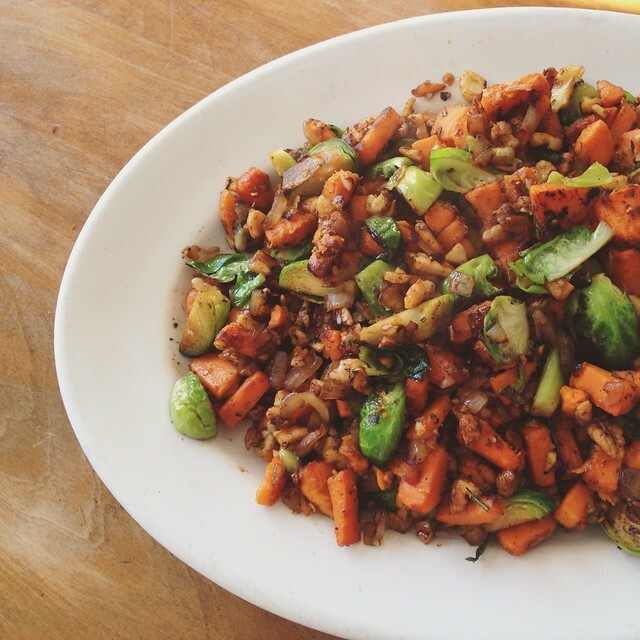 this is the sweet potato hash recipe i whipped up the other day. i posted a picture of this to instagram on monday and a few of the grammers asked for the recipe. so if your visiting from instagram here ya go lovelies! anyone not, well, be blessed with another recipe you didn't know you needed. we can not get enough of this delicious dish! in fact we've already commissioned it as a side dish for next Thanksgiving, it's that good. preheat oven to 450* wrap sweet potatoes in foil & bake for 30 minutes. bake them just enough to get the outsides tender. you don't want a mushy potato. they will finish cooking on the stovetop. wash & quarter the brussels sprouts. pull off the first few outer leaves & trim the base of the sprout just enough to get any dirty bits off. but take care to leave some base intact. this will keep the sprout intact once you quarter them. chop garlic & rosemary. set aside. remove the skin from the sweet potatoes and dice into about one inch cubes. in a large skillet over medium high heat get 1 tablespoon of coconut oil nice and hot. sauté diced sweet potatoes until golden brown. right around five minutes. depending on your stove. once golden remove from skillet & set aside. again working over a medium high heat add 1 tablespoon coconut oil to pan. add brussels sprouts & onion. sauté another five minutes or until onions are translucent and sprouts have a good golden color in parts. remove from pan and set aside. add walnuts, garlic, rosemary & nutmeg to the pan. sauté for a minute or two. just enough to warm the nuts & soften the garlic. take care not to burn the garlic. finally add potatoes & sprouts / onion mix to the pan with the nuts. saute all together for 1-3 minutes. salt & pepper to taste. hope you enjoy! let me know if you try it out. can't wait to make this ... hopefully tonight! Thanks so much for sharing. Just tried it with great results! I didn't have any cocunut oil (used olive oil instead), but it was still very tasty.